It's safe to say that Terrence Malick (The Thin Red Line, The Tree of Life) is a director with an affinity for being in the shadows. For instance, a simple Google Image search returns multiple versions of the same photo (you know the one…where he looks like he's dressed up as Dr. Alan Grant for Halloween and someone yelled "Oh, Terrence!" and snapped a pic of him just as he turned around). Interviews with the auteur are even rarer. 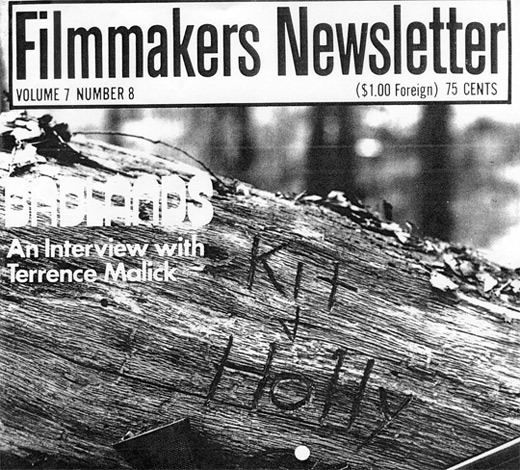 So, when we came across a conversation with Malick from a June 1974 issue of Filmmaker's Newsletter found on the All Things Shining: The Terrence Malick Blog, we just had to share it. The interview itself focuses on the filming of Badlands - Malick's 1973 directorial debut, which he also wrote, starring Martin Sheen and Sissy Spacek in a "dramatization of the Starkweather-Fugate killing spree of the 1950's, in which a teenage girl and her twenty-something boyfriend slaughtered her entire family and several others in the Dakota badlands." The quick-fire Q&A between the writer/director and G. Richardson Cook (the interviewer who also happened to be a Production Assistant on Badlands) is a fascinating conversation about making an independent feature outside of the studio system and without a distributor in place at the time of production in an era of Hollywood during the '60s and '70s where this type of filmmaking was still kind of emerging and evolving (in comparison to modern independent filmmaking at least). So much was different and yet so much was the same (for example, approaching dentists and lawyers for funding and lying about your production costs). If you're an independent filmmaker yourself, a fan of Malick's work, or just a film lover in general, this vintage gem is a must read for sure. seems to be a private blog... who might I contact to plead for an invite?